Sinatra is one of your favorite lamps, right? Good, because we’re talking about that lamp today! Back with the details again! Color finishes are the trending topic today. And which lamp is the perfect one when it comes to color and brightening up a place? Sinatra, of course! DelightFULL samples, like their furniture, have been selected based on performance and quality. Colors and textures on your computer monitor may vary slightly from the actual materials. Digital surface material images are provided as a preliminary color reference and should not be used for final color selection. For accuracy, you should order and view an actual sample. Due to individual computer/ monitor settings: color, texture, and pattern size may vary from the actual sample. Perfect colors and handmade pieces seem like the perfect combo. Sinatra Suspension Lamp is a modern chandelier that was inspired by Frank Sinatra’s song “New York, New York”. Handmade in brass and with a nickel plated finish, Sinatra reflects the popular classics from the mid-century modern period of design. The three lamp shades have a distinctive appearance crafted in aluminum and have a glossy red finish. The counterweights are made of iron and have also a glossy red finish. Both these features can be customized in every RAL color of your choosing. With the possibility of having 1 to 5 moveable arms, this mid-century chandelier is suitable for the most demanding setting. Ideal for your mid-century house interior, Sinatra can serve as a centerpiece in a wide range of decors. 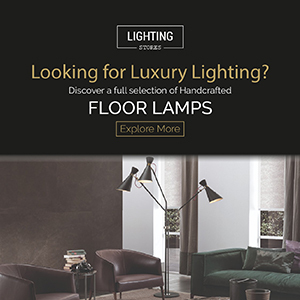 You can find the version of Sinatra in floor lamp as well! If you ever find yourself listening to Sinatra while drinking a cocktail in a mid-century bar, this lighting design will be there. A sculptural and versatile creation, the iconic modern floor lamp features three articulating arms handmade in brass that are adjustable in a variety of different locations in order to allow you to situate the lights exactly as you need it. Always standing by craftsmanship values. London City: What Are The Best Getaways?